Three planets were discovered outside the solar system. 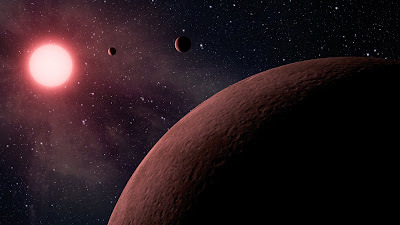 The discovery by a team of astronomers led by scientists at the California Institute of Technology (Caltech) announced that the three are the smallest confirmed planets ever detected. The three planets orbit a single star and are smaller than Earth and appear to be rocky with a solid surface. Until now, astronomers have found at most only four other rocky planets, also called terrestrial planets, around other stars. The trio of new planets is too close to the central star to be in its habitable zone—the ring-shaped region around a star where the temperature is mild enough for liquid water, and possibly life, to exist. But the planets are the first rocky ones to be found orbiting a type of dim, small star called a red dwarf, the most common kind in the Milky Way. Their existence suggests that the galaxy could be teeming with similarly rocky planets—and that there's a good chance that many are in the habitable zone. The red dwarf, called KOI-961, was first flagged as a potential planetary system by the Kepler mission, a space telescope that looks for planets around sunlike stars by scanning the sky for stars that periodically dip in brightness—the result of one or more planets passing in front of them. Although Kepler reported 900 potential planetary systems in February, only about 85 of those were red-dwarf systems. The fact that a relatively small sample of red dwarfs produced three terrestrial planets means that either the Caltech-led team was really lucky or, more likely, that these planets are commonly found around red dwarfs. "When you combine that with the fact that these are some of the most numerous stars in the galaxy, you realize this type of system could be common," says Philip Muirhead, a postdoctoral scholar at Caltech. "There's no question that it's exciting." Muirhead is the lead author on the paper describing the discovery, which has been accepted by the Astrophysical Journal. The team will also present their results in two talks on January 11 at the meeting of the American Astronomical Society in Austin, Texas. "Red dwarfs make up eight out of every ten stars in the galaxy," adds John Johnson, assistant professor of astronomy and one of the paper's coauthors. "That boosts the chances of other life being in the universe—that's the ultimate result here. If these planets are as common as they appear—and because red dwarfs themselves are so common—then the whole galaxy must be just swarming with little habitable planets around faint red dwarfs." This report comes just a few weeks after the Kepler team announced it had detected two rocky planets around a sunlike star—Kepler-20e and Kepler-20f—the first Earth-sized planets ever found and the smallest known at the time. In January 2011, the Kepler team reported the discovery of the first unequivocally rocky planet around another star, Kepler-10b. Another planet—Corot-7b, which was found in 2009—could also be a rocky planet. With the exception of Kepler-20e, which is about the size of Venus, the other previously discovered planets are all bigger than Earth. All three of the ones found by the Caltech-led team are smaller—the outermost one is about half the size of Earth (similar to Mars) and the other two are three-fourths the size of Earth (smaller than Venus). In fact, the entire KOI-961 planetary system is remarkably tiny. KOI-961 has a diameter one-sixth that of the sun's, making it just 70 percent bigger than Jupiter. Each of the three planets needs less than two days to zip around their star, and all three are about one hundred times closer to that star than Earth is to the sun. And because they're so close to their star, they're hot—the outermost planet is estimated to be about 200 degrees Celsius (400 degrees Fahrenheit) while the innermost planet is a scorching 500 degrees Celsius (more than 900 degrees Fahrenheit). "The really amazing thing about this system is that the closest size comparison is to Jupiter and its moons," Johnson says. "This is causing me to have to fully recalibrate my notion of planetary and stellar systems." Kepler's initial measurements—which are automated to help it sift through roughly 150,000 stars—underestimated the size of KOI-961 and any planets it might have had. No one realized this until amateur astronomer and paper coauthor Kevin Apps alerted Muirhead and his team to the idea that KOI-961 bore a remarkable resemblance to another red dwarf called Barnard's Star, a nearby star that's one of the most well-studied. "That's what blew the case wide open," Johnson says. When the astronomers used telescopes at the Palomar and Keck Observatories to take a closer look at both stars, they found that the two are practically twins. The characteristics of Barnard's Star allowed the team to infer the properties of KOI-961, which is needed to deduce the nature of the planetary system from the star's light curve—a plot of how the star dims over time due to transiting planets. In particular, the depth of the light curve—that is, how much the curve dips—reveals the planets' sizes. Because the planets are so small, the only way they could have enough gravity to hold themselves together is if they are balls of rock, like Mercury, Venus, Earth, and Mars. "Just three years ago, just talking about a rocky planet would have been pure speculation," Johnson says. "But these are unambiguously rocky." Still, before they could make any conclusions, the researchers had to confirm that the dips in light detected by Kepler really were due to planets—and not something else, such as a pair of background stars in orbit around each other. To do so, they turned to old photographs taken by Palomar Observatory's 48-inch Samuel Oschin Telescope in 1951. Because KOI-961 is relatively close—about 130 light-years away—it appears to drift across the sky relatively quickly, so that a photo taken in 1951 would show it in a different location than a current image would. By comparing pictures of KOI-961 over the years, astronomers can check whether there are any stars behind it that could produce the light dips they saw. They found none. Instead of a planetary system, the dips could also be caused by stars in orbit around each other. But the researchers analyzed the statistics of such a scenario and found that it's very unlikely. Combining these statistical results with the observations that show a lack of background stars, the astronomers concluded that the light dips from KOI-961 are indeed produced by three small, terrestrial plane.